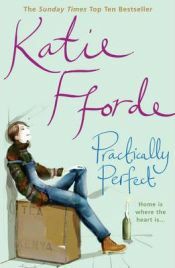 Katie Fforde is one of my favourite contemporary authors particularly when I am looking for a slightly lighter read. I have just finished reading ‘Practically Perfect‘ and although, for some reason, I found it a bit difficult to get in to, by the end I was thoroughly enjoying the story! ‘Practically Perfect’ tells the story of Anna, a newly qualified interior designer, who is trying to prove herself by doing up a small cottage in the Cotswolds. This is not without its difficulties though, as the cottage is listed and therefore subject to all sorts of rules and regulations! Along the way, Anna is befriended by Chloe, her friendly neighbour, and her brood of noisy boys. She is also persuaded to take on ownership of Caroline, a former racing greyhound in need of a good home! There is love interest in the form of Max, for whom she has held a candle for years, but also Rob, who is definitely much more comfortable and easy to be around. When reading this book, it feels like a nice gentle meander to start with although towards the end everything does tend to reach crisis point which definitely keeps you guessing – I mean you wouldn’t want it all to be too gentle as there really wouldn’t be much of a story! It is also quite an interesting read if you are a fan of programmes such as ‘Property Ladder’ or ‘Grand Designs’, as we share with Anna all the trials and tribulations of renovating a listed building from the flooring to the staircase, all of which have to meet exact specifications! The story actually have a number of threads running through – the interior design of the cottage; the looking after of Caroline the greyhound; life in a small country village; and what is probably of primary interest to most female readers – the love story! All of these threads are woven and integrated well in order to provide an absorbing read. I think Katie Fforde is very good at creating well rounded, interesting characters. Most are very likeable and once you start liking them you start to care about what happens to them! Anna makes a very interesting central character – tenacious, industrious, caring, confused, and above all a walking disaster as far as her own love life is concerned, never daring to trust her own feelings. For the reader she can be very frustrating as you will her to make the right choices for her! Rob and Max are the two characters who affect Anna’s heart in different ways – both again are well developed and contrast well with each other. Some other characters are quite comical such as Max’s mother who is certainly a snob! She is both pompous and opinionated and does not even admit to buying cakes from the local WI cake stall! I think ‘Practically Perfect‘ is a nicely paced novel – a very gentle read although there are definitely a couple of quite tense events as well. It is not the sort of book that is going to test your intellect in any way, but if you are looking for a bit of escapism after a hard day at work or looking after the children, I would definitely recommend this book. No Comments on "Practically Perfect"